Beautiful specimen certificate from the Ghost Town and Calico Company printed in 1954. 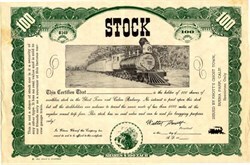 This historic document was printed by Phillip H. Gilkerson and has an ornate border around it with a vignette of a train. This item has the signatures of the Company's President, Walter Knott and is over 53 years old. This certificate was issued by Knott's Ghost Town (aka Knotts Berry Farm) as a souvenir. This is the only one of these we have seen. More than a century ago, the town of Calico was bustling with prospectors. Founded in March 1881, it grew to a population of 1,200 with 22 saloons and more than 500 mines. Silver was king, and the Calico Mining District became one of the richest in California, producing $86 million in silver, $45 million in borax and, of course, gold. After 1907, when silver prices dropped and borax mining moved to Death Valley, Calico became a ghost town. Today, Calico is one of the few remaining original mining towns of the western United States. It was preserved by Walter Knott (founder of Knott's Berry Farm and a relative of the owner of Calico's Silver King mine). Mr. Knott donated Calico Ghost Town to the County of San Bernardino in 1966, and it remains alive and well as a 480-acre County Regional Park. Lively events and living history reenactments are hallmarks of this exciting park.